It is likely very few people know that OCCC has multiple walking trails. One of these walking trails even resides inside the campus buildings. This indoor trail is not an established trail, as the trails outside are. As basic as it seems, this trail is simply a path that one can walk, throughout the main campus building and into its many sections, such as the Transportation Technology Center, the Social Sciences Center and many others. On a cold winter day, this young, energetic reporter decided it was time for a stroll. With the temperature outside being below freezing, I determined it was time to put this indoor walking trail to good use. Spanning a total of 1.04 miles, I knew it would be no cake walk. It would take an extreme amount of focus, mental drive and perseverance. My journey began at the Main Building entrance, at the Welcome Desk. On my trek, I walked past the President’s office, my own home at the Pioneer office and through the Health Professions Center. All along the way, I received many odd looks. I then took a trip through the dining area and onward still into the Social Sciences department. A few more weird looks from passersby led me to evaluate myself. It was then I realized people assumed I was lost. I traveled further still, on the longest section of my journey: the Transportation Technology Center. I expected odd looks there as I stuck out like a sore thumb; however, it was deserted. I powered on and as I neared the end of my journey, I glanced at a nearby clock. I had only been gone for 17 minutes, but I had enjoyed every moment. In the end, I would recommend the walking trail to anyone looking for a quick exercise regimen while on campus. 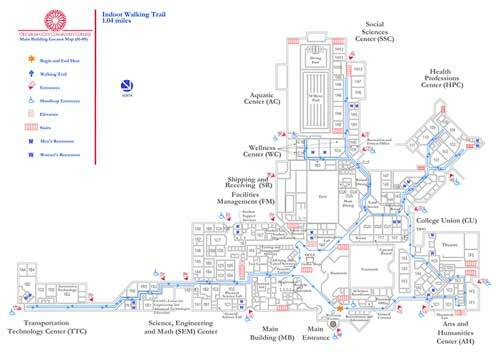 To find a map of the walking trail, visit www.occc.edu/rf/pdf/walking-trail.pdf.